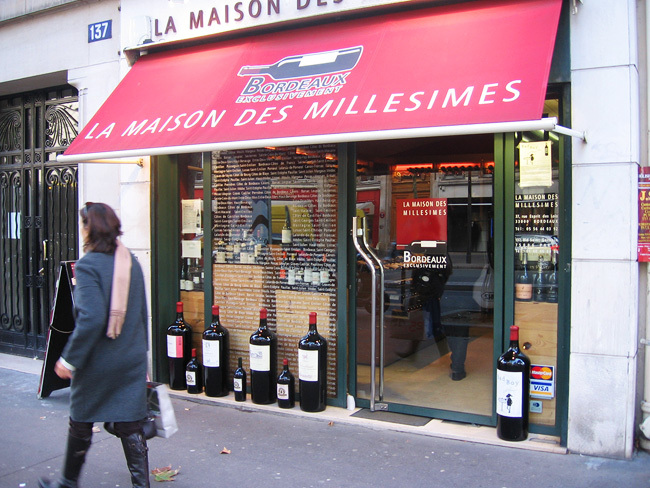 A typical Parisian wine store. I think those bottles are the recommended serving size. Wine is something I don't know a whole lot about; I just know I really like drinking it! I won't waste your time trying to educate you about wine itself (there are much better websites and books for that), but what I can do is give you some advice for buying a good bottle during your stay in Paris. 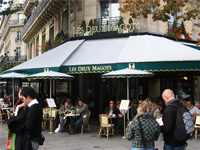 There are three main places to buy wine in France: the supermarket, the wine store, and little corner markets, called epiceries or alimentations generales. Let's start with the supermarket. Every supermarket in Paris has a wine section; in some stores it's huge! This is the cheapest place to get wine, and there's usually a range from terrible, dirt cheap stuff (around 2 euros), all the way up to the really good, very expensive stuff (20+ euros). I'm not a rich guy by any means, and my rule of thumb is that generally anything over 6 euros is usually good, sometimes great. I usually shoot for something in the 6 to 10 euro range, and I'm rarely disappointed. A little info for comparison: Back in my life in the States, I found that I had to spend at least 15 bucks for a decent bottle of wine. My method was basically to try to find a good bottle between $12 and $17. So it was a bit of a challenge to let myself start buying 6-euro wine in Paris, but as soon as I gave it a shot I realized with much delight that it's possible, easy really, to get a really good bottle in France without spending an arm and a leg. I chalk this up to what I see as a sort of philosophy in France that good wine, like good bread, is a basic human right. Vive la France. Anyway, then there's option two, the wine store! 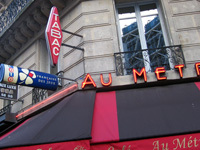 You'll see these all over Paris; you can't miss them with their huge front windows full of beautiful bottles. While it's possible to find good deals in these stores, they are generally a lot more expensive than the supermarket wine department. However, this comes with two great benefits: One, I've never had a bad bottle of wine from one of these stores, because the owners are people who really care about wine and seek out the best products to offer in their stores. The other great advantage of the wine store is that the owner and/or staff will be able to give you fantastic advice on a good bottle to buy, based on your tastes, your price range, what you're having for dinner, etc. If you're lucky enough to find an employee who speaks your language, they'll be extremely happy to help you find the perfect bottle; even if they don't speak much English they'll probably be able to give you some very useful basic advice. I recommend this experience if you can afford to do it at least once; it's worth paying a bit more to know you're getting a bottle that an expert has taken real pride in helping choose for you. These small family-run stores carry a little bit of everything; groceries, snacks, toiletries, wine, etc. It's important to know that these stores are generally much more expensive than larger supermarkets; the exact same item, same brand and everything, can literally cost twice as much in these smaller markets. The one huge advantage here is that these stores are open late! 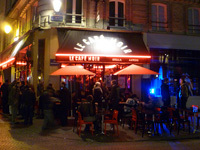 You'll probably learn quickly during your stay in France that a lot of businesses close very early, and a lot of things are closed on Sundays and/or Mondays. It can be kind of unbelievable if you're coming from America, the land of convenience  even in a large, modern, cosmopolitan city like Paris, lots of big supermarkets close as early as 7pm! I've been here for years and I'm still shocked by this sometimes. So anyway, there are tons of small corner markets all over Paris, and they're almost all open seven days a week, and most of them stay open 'til around 1 or 2am every night. It's wonderful to have this option when it's getting late and you want a bottle of wine (or a Coke, or a snack, or whatever), so long as you realize you're going to get gouged on the price, and the wine selection will probably be somewhat small and maybe not of the best quality. 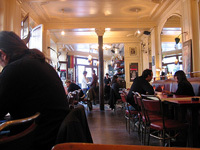 But the epicerie has saved countless evenings for Parisians and tourists alike; sometimes it's late and you just need a bottle of wine, by any means necessary. I should note, I've often been happily surprised at the quality of a 8-euro bottle I've picked up from l'epicerie (which would probably be a 4-euro bottle at the supermarket), so it's definitely possible to get lucky. Anyway, regardless of where you buy your wine, the vast majority of bottles you see will be French, and of course while you're in Paris you should take advantage of French wines without the import fees we pay in the US. But if you indulge in multiple wine-buying outings, I recommend you take a look at some of the Italian and Spanish wines too, which are often my favorites, and since they come from relatively close by, they're not much more expensive. Incidentally, it's funny to see crappy California wines in Paris with the prices marked way up!